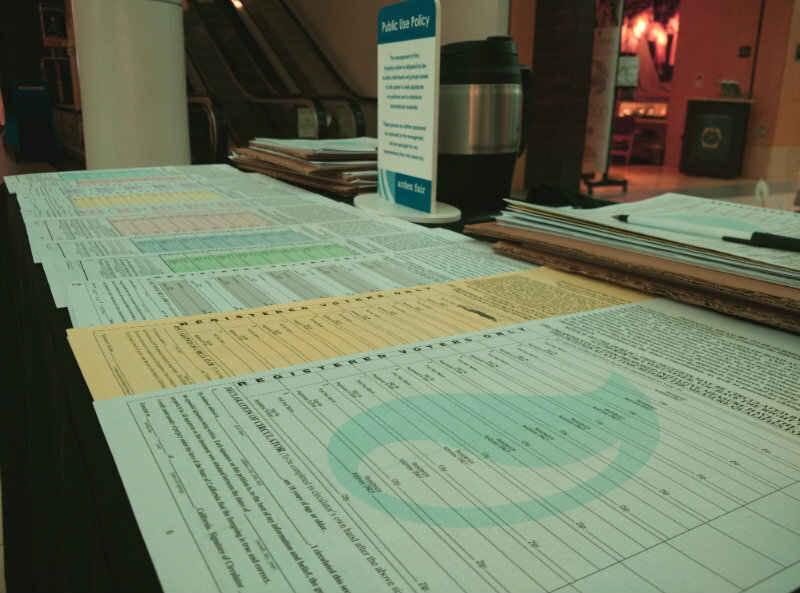 A table with 11 different ballot initiatives piled across it. Roscoe Downey (not pictured) is trying to collect signatures on all of them. They call to you from street corners or in front of the supermarket: Signature-gatherers, asking you to put your name down to help a measure qualify for the November ballot. At a small folding table in the aisle of a mall, Roscoe Downey spreads out 11 different ballot initiatives. "This one’s on a tax extension on those that make more than $250,000 that goes directly to our schools," Downey says. "Then I’ve got one on hospital compensation, where it limits what executives can make." He wants every passerby to sign as many as possible, including competing death penalty measures. "Just depends on whether you’re for or against the death penalty. Both of them save money," says Downey. Downey’s not part of a campaign, and he’s not a volunteer. He’s an independent contractor, hired by a signature-gathering company. He gets paid for each name he collects on each initiative. "When I’m in front of a store, I usually do three or four," Downey says. "Here in the mall, sometimes people will stop and do them all." Downey says it’s just a temporary job. "It’s better than nothing," he says. "I don’t want to go on welfare, I’m just doing this until I find something better." The business of signature-gathering has become a multi-million dollar fixture of California politics. Democratic political consultant Steve Maviglio says this is the only way to qualify an initiative. "There hasn’t been an all-volunteer ballot measure that’s actually made it to voters since 1988," says Maviglio. "So you need these folks that can stand around in front of Target and Walmart and get your signature. Otherwise, it can’t be done." California currently requires roughly 350,000 valid signatures to qualify an initiative for the November vote, and nearly 600,000 if it would change the Constitution. This year, about a dozen campaigns are paying companies to qualify their initiatives. "2016 has been the mother of all signature-gathering years," says Maviglio. The high demand for a limited supply of signature-gatherers has driven up the price of each name. "Typically in the past, it’s been $2 or $3 at the max, and now we’re seeing nearly double that," Maviglio says. Each campaign competes against the others, setting their prices, so signature-gatherers will prioritize their initiatives. The price varies based on how many signatures are needed and how quickly, as well as the difficulty of explaining the measure to voters. Leading the pack currently at $5.50 per name is an initiative that would require a 72-hour waiting period before state lawmakers can pass each bill. 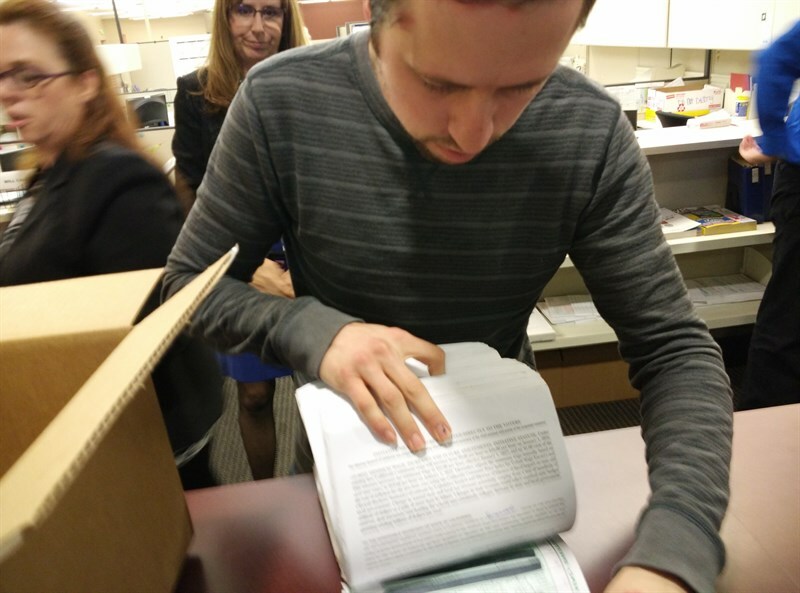 "I’ve never seen prices this high before on these petitions," Carl Towe of CTA Petition Management told his crew of signature-gatherers on a recorded call last month. "So you got a chance to make a lot of money here." This is nationwide enterprise. Signature-gatherers will sometimes migrate from state-to-state with their initiative processes. The competition has squeezed out at least two ballot measures in California—one to divert high-speed rail funds to water projects, the other a property tax initiative. Consultants are now recommending campaigns budget roughly $5 million for signature-gathering. The industry has been criticized for essentially putting a bounty on each name. Critics say it incentivizes signature-gatherers to mislead people about what they’re signing, and since they’re independent contractors, the companies aren’t liable. Towe dismisses those complaints. "It’s right there in front of them. You can’t make somebody read something if they don’t want to or they don’t have time or whatever," says Towe. The amount of money involved has drawn critics. Kathay Feng with California Cause, an open government group, says the initiative system was designed to give Californians a direct voice in government, but the cost has grown prohibitive. "The regular average Californian is largely shut out of that process," says Feng. "Unless you have access to millions of dollars, you really don’t have that safety valve anymore." The California Legislature has passed what would be a major change to the state’s initiative process. A measure on its way to Governor Jerry Brown would ban paying initiative signature-gatherers for each voter signature they collect. Could All-Latino Slate Motivate Higher Voter Turnout In San Diego Neighborhood?